Fans of Zen 1077 Robocab Deluxe: take note that the comic will continue in the next edition, probably. John Betton ("A New Old Love") lives in St. Albert, Alberta, where he co-founded the Saint City Writers forum. David Boski ("Routine") is a poet living in Toronto. David plans to release a chapbook this year. Gregg Dotoli ("Six Haiku") is a white-hat hacker and poet whose collection Poetry Fob is available from Underground Books. John Grey ("A Small Book Unread") is an Australian poet currently living in Rhode Island, USA. Jay Merill ("The Cave behind the Waterfall") lives in London UK, where she is writer-in-residence at Women in Publishing. Visit Salt Publishing to learn about Jay's short-story collections, God of the Pigeons and Astral Bodies. Habib Mohana ("The Accident") is an assistant professor of English living in Dera Ismail Khan, Pakistan. Habib writes in English and Urdu as well as his mother-tongue Saraiki. Jonathan R. Rose ("War Toys") is a frequent contributor to this mag. Check our Sitemap for his other stories. Jonathan's novel Carrion is available on Amazon. Daniel Shooter ("Office Revenge") describes himself as part-time music teacher and part-time stay-at-home dad. Ajay Tulsiani ("Hawks and Doves") lives in Mumbai where he is an editor for Slice of Life Literary Magazine. See some of Ajay's poetry in his collection Romance the Night. Steven Wright ("Stolen Heart") is a police officer in Toronto. Grain Magazine plans a special Summer 2019 issue dedicated to the work of indigenous writers and storytellers. Grain invites submissions of unpublished fiction, nonfiction, and poetry from all First Nations, Métis, and Inuit writers. 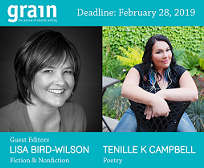 Guest editors Lisa Bird-Wilson and Tenille Campbell encourage submission of exciting, edgy, engaging contemporary fiction, nonfiction, and poetry that reflect Indigenous lives, concerns, moments, thoughts, dreams.